Inside this pack, you’ll find samples of some of our most sought after award-winning products and it ships FREE* right to your door. 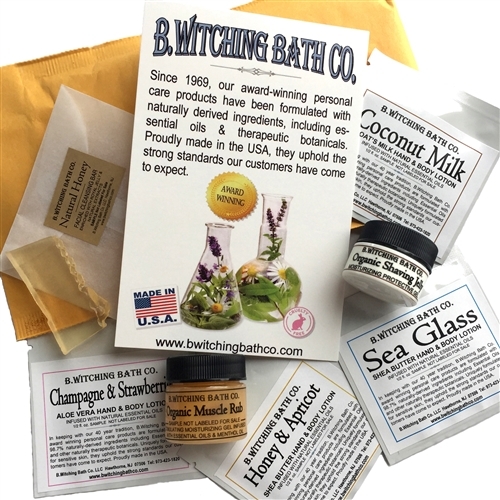 New to B.Witching and want to see why are clients are raving about us? 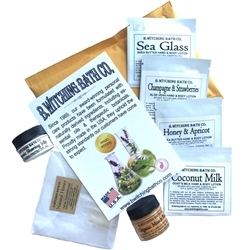 Order this pack and you will get to try the best of our cruelty free American made products. 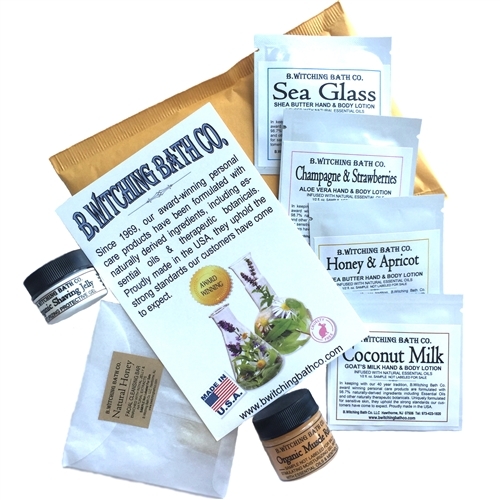 Pack includes samples of: Natural Honey Facial Cleansing Bar, Organic Muscle Rub, Organic Shaving Jelly, Sea Glass Lotion, Coconut Milk Lotion, Honey & Apricot Lotion and Champagne & Strawberries Lotion. Plus a special 10% discount card to be used on your next order. I have been holding off on trying this company's products. I just didn't want to buy a whole bottle and pay for shipping to just waste money. I tried all the samples in this pack and everything is a home run. Good samples and the discount helps too. Opened my sample kit today. It was just as pictured and exactly what I needed to understand these products. Small but worth it. Thanks B.Witching! I have been a fan of your products for years. Yes, I'm the one who always asks for samples :) I order this pack and was delighted to try products I've had my eye on for a while. Iwill be ordering the muscle rub and shaving jelly with my next order. Loved them both and thank you for the free shipping too. I just recd this kit. It's just as pictured. A simple sampling of the products they have won awards for. I liked all the products but one. It's just not my taste. I would recommend this kit as a way to try their stuff out. My only recommendation would be to upgrade the shipping envelope. Thanks.